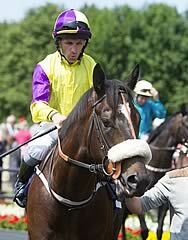 Astaire gave trainer Kevin Ryan a third success in the Irish Thoroughbred Marketing Gimcrack Stakes at York following the victories of Amadeus Wolf in 2005 and Blaine last year. Neil Callan employed positive tactics from the off aboard the 5-1 shot, with favourite Parbold pushed along in the early stages to get a prominent position alongside, and My Catch also blazing an early trail. However, as their early exertions began to tell, Astaire kept on powering away in front and while Wilshire Boulevard came with a strong surge in the final furlong, it was too little too late as Astaire came home a neck to the good in the Group Two contest. Callan said: "Kevin seems to pick one out for the race every year - they might have to start calling it the Kevin Ryan Gimcrack! This is a lovely horse, I can't praise him enough. He's had to do it the hard way and make his own running. He's a classy horse and he's got a big future." Ryan added: "When the rain came, the ground was the big worry. I looked up his pedigree and some of his relatives had won on soft ground, but that was in Ireland. "The last furlong felt like five furlongs - I thought the line was never going to come. He ran a little with the choke out but he's very relaxed at home. When Neil gave him a squeeze and he took a couple of lengths out of the field, I thought they won't get to him now. "All my Gimcrack winners have been good horses. He will go straight to the Middle Park now. It's too early to think about next year and that will look after itself." Pat Keating, travelling head lad to Aidan O'Brien, trainer of runner-up Wilshire Boulevard, said: "He ran a very good race and Ryan (Moore) said the same."